A rental car seems to be the perfect way to discover Alicante, a popular vacation destination in the warm south-east of Spain. This beautiful harbor town enjoys a fantastic location on the Costa Blanca and is only a relatively short drive away (approximately 4 hours) from the capital city of Madrid. Alicante meets the requirements of many different types of travelers—those longing for a relaxing holiday on a sunny beach, nature lovers, and anyone wanting an exciting city break. This beautiful area with its mild, mediterranean climate can be explored cheaply and comfortably thanks to a large rental car offer in Alicante. With Driveboo, you can compare offers of many different car rental companies and choose the one that best suits your needs. Where can I rent a car in Alicante? Car rental companies in Alicante can be found in a number of locations right in the city. It is also possible to take advantage of the car rental stations at the airport. The closest airport to the city is Alicante Airport (ALC), located only 9 km from the city center. In the arrival area of the terminal building, you will find desks of six major car hire companies. If you are doing a Europe trip or something similar and choose to travel to Spain by train, do not worry, you'll find car rental stations all over the city. If you arrive at Alicante central railway station, you can easily rent a car right there as well. Finding the perfect car rental company for your needs, especially when there is such a wide range of offers, may appear to be quite challenging. Luckily for you, Driveboo can help you to find a rental car easily and successfully! Every car rental company in Spain is obliged to offer insurance for your rental car. If available we recommend to buy a full insurance without non-waivable excess in case of an accident, damage or theft. Additionally, rental cars in Spain are also required to have fire insurance and third party liability insurance coverage. Speeding in Spain may be punished by a fine of several hundred to a few thousand euros, depending on the degree of the offense and the driver's income. The legal blood alcohol content in Spain is 0.05% (breath alcohol content: 0.25 mg/l), and 0.03% (breath alcohol content: 0.15 mg/l) for drivers with less than two years of experience. Exceeding this limit may lead not only to a high fine, but also to a driver being arrested and taken to the nearest police station. What other offenses are punishable in Spain? The driver and any passengers occupying the front and rear seats of the vehicle are all required to wear seatbelts. Law enforcement officers can punish a driver or passenger for not wearing a seat belt with a ticket of 90 euros per person. If you park in an unauthorized place, you can expect a penalty of up to 300 euros. Many people considering Spain as their holiday destination decide to go to one of the country’s major cities, such as Madrid and Barcelona, or to island paradises like Ibiza and Mallorca. As well as these undoubtedly popular destinations, there is much more to discover in this beautiful country. 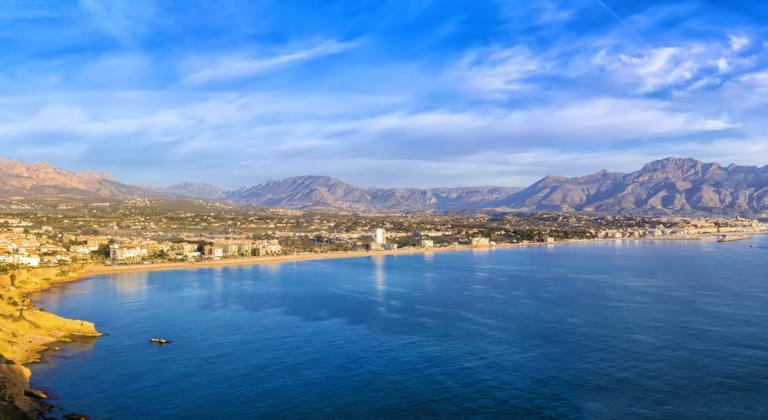 Alicante and its surrounding area is a fantastic option—the city, which has a population of about 330,000 inhabitants, has had an exciting history, which is still reflected in the numerous sights from different eras. One of the most important locations in the region is the Castillo de Santa Barbara. This large and old castle is located on Mount Benacantil, and is visible from all over the city. From the top of the mountain visitors can enjoy an impressive view over Alicante and the Mediterranean Sea. It is possible to either hike all the way up the mountain or to drive up and leave your rental car in the parking lot at the gates of the castle. If you want to explore the stunning natural scenery around Alicante, you can take your rental car to Penon de Ifach. This imposing limestone rock lies directly on the sea and is 300 meters tall. Impressive waterfalls and natural swimming pools can be found in the nature reserve of Fuentes de Algar. There, you will find parking lots where you will be able to leave your rental car. If you love hiking, you should head to the mountains of Sierra de Bernia.